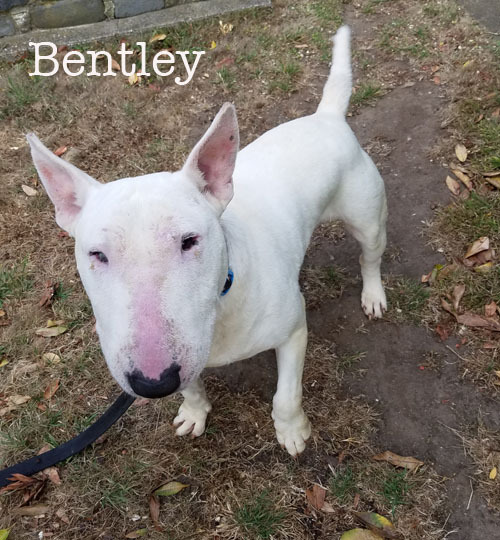 Bentley in San Francisco, CA | Bull Terrier Rescue, Inc.
← Rocky in Sebastopol, CA – ADOPTED! Bentley is a 2yo guy who wandered into a ranch in Prunedale, CA and made friends with the resident cattle. We rescued Bentley from the shelter after he recovered from pneumonia. This 50lb guy is good with dogs but unknown with the kitties. Bentley is crate and leash trained; he keeps his crate clean so we believe that he is house trained. Does anyone have room in their hearts and home for this sweet and affectionate guy?